A little tidbit about myself is that I get addicted to certain snacks and will eat the same thing almost everyday for months until I have a new snack that wins my favor. It might be nachos (an old standby), rice crackers and goat cheese, hummus and chips, brie with apples, greek salad with feta . . . as you can see cheese is often a main component. 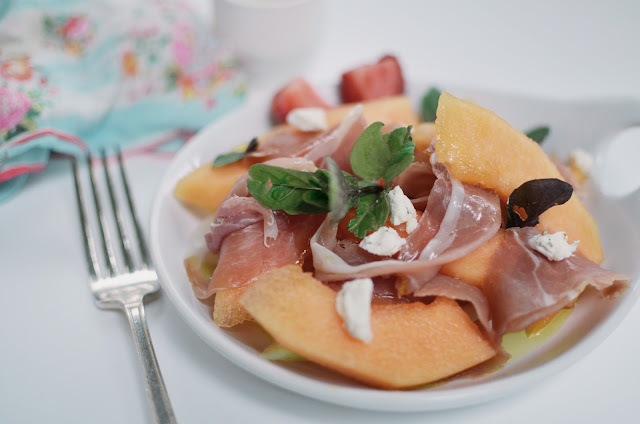 I also love a sweet and savory mix and right now I can't get enough cantaloupe and prosciutto with goat cheese. 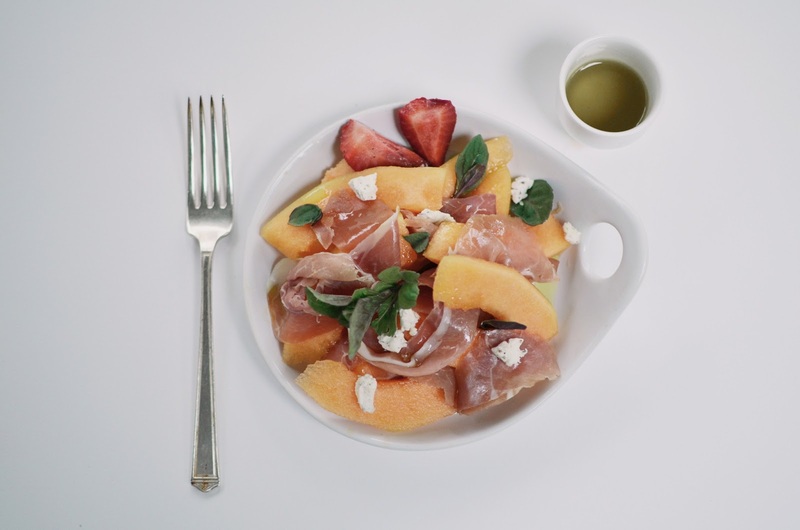 Last week I bought a cantaloupe, sliced it open and it was just perfect for this little salad and with spring in the air I found myself bringing this one back into rotation. It's so simple, which is probably the governing factor for any of my snacks of choices. There's many variations on this so feel free to add or take away if you don't have your own recipe already. For mine I use cantaloupe and prosciutto (obviously) - I prefer a crisp but sweet cantaloupe for this recipe and my prosciutto cold, straight from the refrigerator. I drizzle a little olive oil, crumble some herbed goat cheese and top it off with fresh french mint leaves. 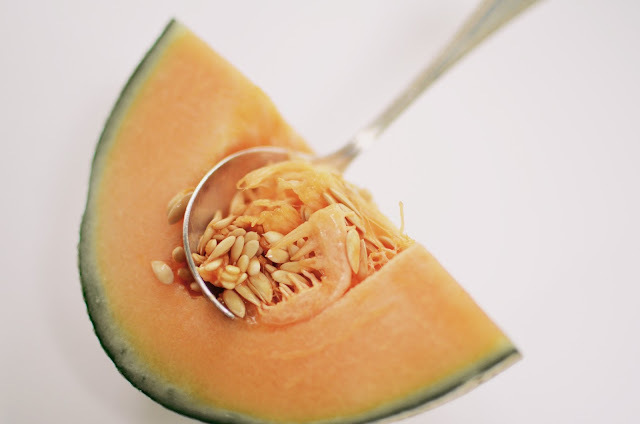 Fresh ground peppercorns can be added as well but I can't seem to add pepper to my melons. You could also use basil or feta as alternates to the mint and chèvre cheese, or add a little honeydew to the mix. Qué rico y qué apetitoso. Las fotografías son preciosas. OH YUM! i forget about certain combos sometime - need to get myself a cantaloupe! 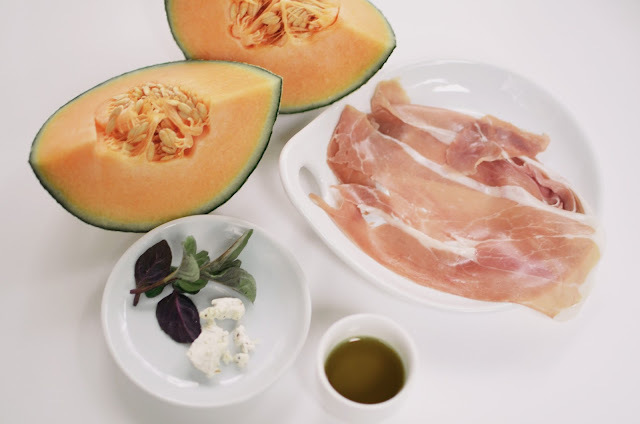 Strangely enough, melon and prosciutto is our Christmas day snack (although not with goat’s cheese – I am unconvinced that anything good can come from a goat). It’s so refreshing and light. I also love hot toasted pita breads with as much hummus as humanly possible. Pardon me while I drool all over myself....OMG. Want. That. NOW. Ahem! Twinsy, further evidence of our twinsy-dom is that we both need cheese in any and all forms, and our compulsion to eat the same thing over and over and over. My current standby is extra sharp cheddar and rye triscuits. For a while it was Laughing Cow with Club crackers. Before that it was chevre and those Carr water crackers. So basically cheese and crackers, in varying degrees of classiness, haha. 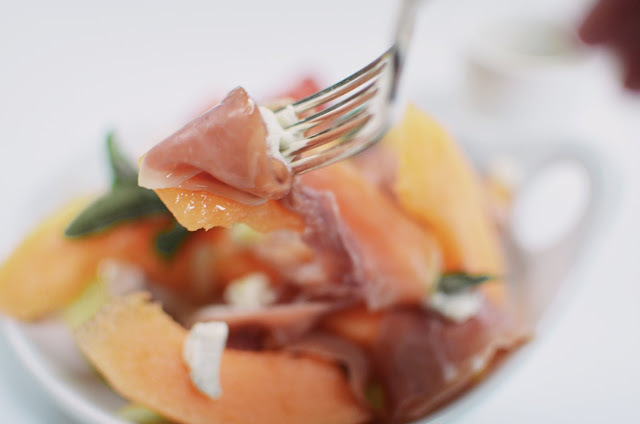 Prosciutto and melon is one of those incredible treats where everything just works SO WELL together that you can't eat it fast enough. If you ever come to the east coast I'm dragging you to one of my favorite little wine bar for their appetizer of poached figs, prosciutto, honey, and pistachios. Yes. It's exactly as delicious as you'd imagine. This is seriously one of my favorites. When I lived in Italy I would seriously devour this probably every day - maybe I even loved it more than gelato. ;) There's something wonderful about savory and sweet together. Yum yum! I love prosciutto! For me, I love dried cranberries in my salad - it's about the only sweet I can do paired with my favorite balsamic dressing. I love adding nuts like almonds or walnuts to my salad for crunch and the savory part! This sanck has everything going for it. Sweet, salty, tangy and that is some amazing looking olive oil there off to the side! Delish!